Scientists used florescent dye and bromide to track river water to which two emerging contaminants had been added – 4-nonylphenol and 17β-estradiol. This allowed the scientists to study the natural attenuation of the two compounds as they were transported down the Redwood River, Minnesota. Photo credit: Jeffrey H. Writer, USGS. A detergent degradation product (4-nonylphenol) and a biogenic hormone (17β-estradiol) added to the Redwood River, Minnesota, were attenuated by biodegradation and other natural processes. These are the findings of a team of U.S. Geological Survey (USGS) and University of Colorado scientists. The findings, published in Environmental Science and Technology, were based on an experiment in a 10-kilometer (6.2-mile) stretch of the Redwood River. 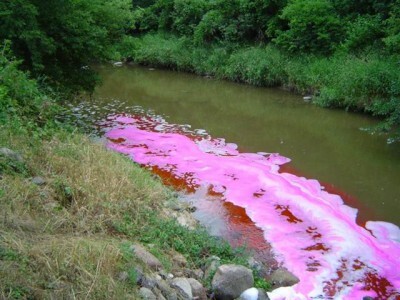 The scientists added a florescent dye, a conservative tracer (bromide), and a small amount of the two emerging contaminants being studied to a part of the river that received discharge from a wastewater treatment plant; the discharge already contained the two contaminants. The water was sampled as it moved downstream to evaluate the chemical and hydrologic processes that reduced the concentrations of these chemicals in the stream. The scientists found that several processes were responsible for the attenuation of the two compounds. In the case of 4-nonylphenol, photolysis, biodegradation, and sorption likely are the dominant attenuation mechanisms controlling its fate in the river. For 17β-estradiol, attenuation was attributed primarily to sorption and biodegradation by bed sediments and a coating of algae and other organic material (biofilm) on the bottom of the river. Because sorption occurs more rapidly than biodegradation, these compounds will bioaccumulate in biofilms, which are an important source of food for stream food webs. Because these compounds were transported kilometers downstream during the slow attenuation process, the additive concentrations from multiple sources and the transformation of parent compounds into degradates (such as detergent compounds into 4-nonylphenol) can explain their environmental persistence. Writer, J.H., Ryan, J.N., Keefe, S.H., and Barber, L.B., 2012, Fate of 4-nonylphenol and 17β-estradiol in the Redwood River of Minnesota: Environmental Science and Technology, v. 46, no. 2, p. 860-868, doi:10.1021/es2031664.